In the game, Emma and Faird are on the bridge. 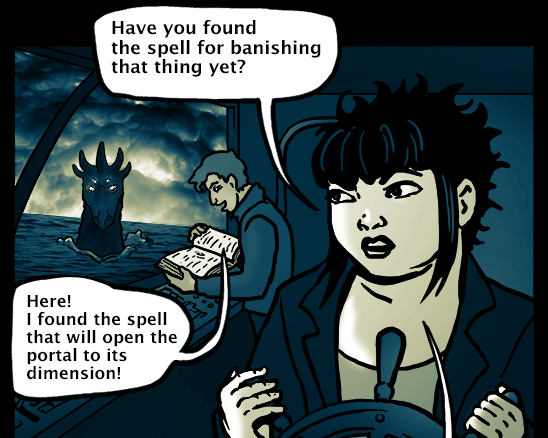 Emma is at the wheel while Farid looks through his spellbook. 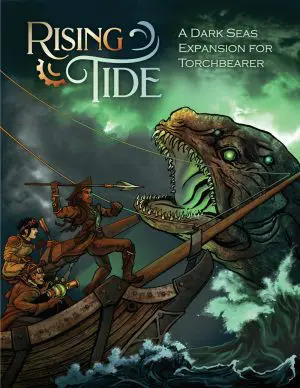 The ship is being pursued by a sea monster. Emma: Have you found the spell for banishing that thing yet? Farid: Here! I found the spell that will open the portal to its dimension! Emma: Hurry up and cast it! It’s gaining on us. The portal opens, but the monster doesn’t go through it. Emma: Why isn’t it going through? Emma turns the ship around and rams the monster back through its portal. At the table, Tash congratulates her players. 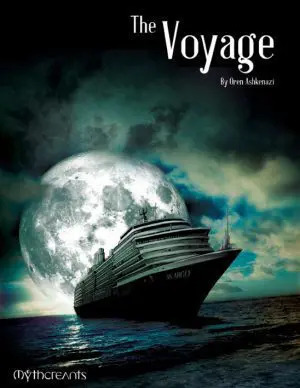 Tash: Congratulations, you have finished The Voyage and recovered your memories. Emma: Be honest, is that how the scenario actually ends? Tash: I may have changed things a little. This final comic brings Role Dice Already to an end. Thank you for going on this adventure with us. Last comic? So sad. Great stories you’ve had, though. Yeah it was a good run but after a lot of consideration, we decided it made more sense to focus our efforts on blogging so we can always have the best content in that department. I will miss these great comics but I understand your decision. Focusing on blogging instead is an understandable decision though; looking forward to more of your usual quality content!